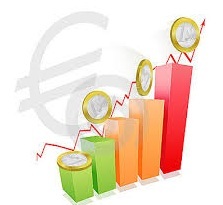 The EUR/USD pair clocked a high of 1.1713 (highest since Aug 2015) on Tuesday before closing out almost on a flat note at 1.1645. The ‘gravestone doji’ look-alike candle signals bull market exhaustion, which gels well with the overbought 14-day RSI. The bull market in the EUR/USD may have reached a point of exhaustion, although over the next three-month period, the outlook remains positive. This is evident from the positive EUR/USD 3 month 25 delta risk reversal. The reading moved above zero levels last week for the first time since 2010. 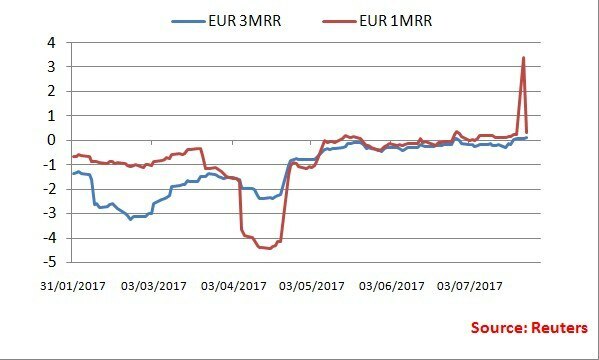 EUR 1MRR faded the spike to 3.4, while the 3MRR has moved into the positive territory. Thus, a pullback in the EUR/USD could be seen in the short-term, although the market is clearly positioned for more gains over the next quarter. It’s all about inflation differential - Unless inflation does not show signs of life, dollar gains are likely to be short lived.